​Storage at Memory Speeds, Memory at Storage Capacities. Using an industry standard DDR4 LRDIMM interface, HybriDIMM is the first SCM product to operate in current Intel® x86 servers without BIOS and hardware changes, and the first unified DRAM-NAND solution that scales memory to terabyte storage capacities and accelerates storage to nanosecond memory speeds. As the creation and velocity of data increases the strain between memory and the CPU increases. Memory while fast, has limited capacity and at those high densities is expensive. NAND flash has revolutionized storage, it has great capacity and while much faster than hard drives it is a 1000x slower than memory access. In this chasm between the price, capacity, performance difference between DRAM and NAND lies a new growing memory tier, Storage Class Memory. Storage Class Memory, is defined as being persistent, near Memory speed and have 100’s of gigabytes of capacity. Not having all three characteristics would mean a module is not storage class memory. Just like many technical challenges there is more than one way to solve the issue. 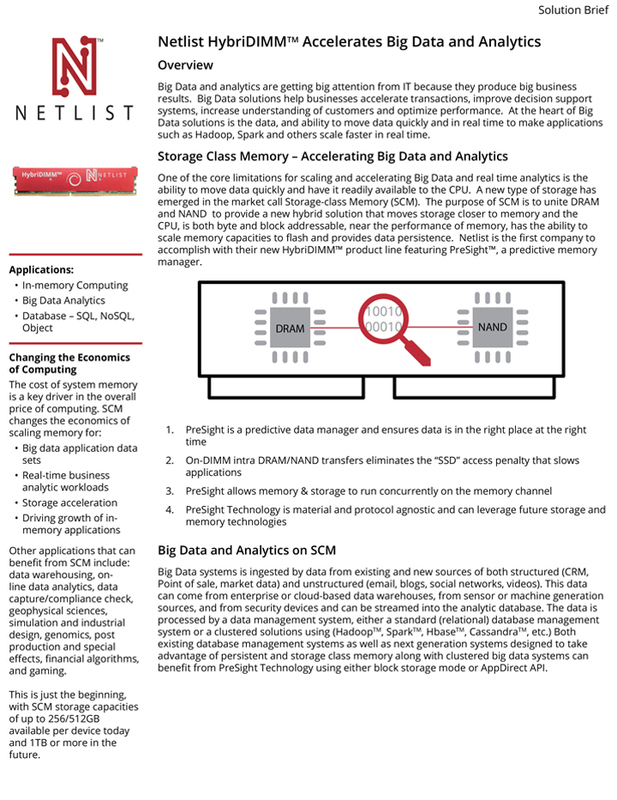 Netlist, with years of leading the Non Volatile Memory industry has devised an combination of DRAM and NAND harnessed by “PreSight Technology” to produce the world’s first true SCM module. HybriDIMM is a breakthrough in computing that is part of the Storage Class Memory revolution that will change computing forever. 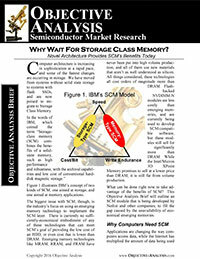 Applications are limited by the economic cost of system memory. The latency gap between volatile and non-volatile technologies is growing.The next wave of business success comes from being able to study data, derive an insight that was hard to find, and to do it faster than the competition. HybriDIMM allows terabytes of system memory to be addressed by applications and persist data in a simpler manner than available today. HybriDIMM unlocks new application possibilities and helps businesses gain even more value from their CPU's. HybriDIMM technology is an all new architecture that combines the proven raw materials of DRAM and NAND into a single persistent memory space. It has the same Load / Store model as DRAM, runs at near DRAM speed but with capacities usually associated with traditional storage. It can do all of this at a greatly reduced cost compared to DRAM and without system modification. HybriDIMM uses a Storage Coprocessor onboard the DIMM to intelligently manage the transfer of data between DRAM and NAND on the same DIMM. It is this Coprocessor intelligence that is the result of many years of design, engineering at Netlist. This IP and DIMM architecture is fully protected. By placing the focus on the intelligence in the coprocessor Netlist enables existing proven materials to perform at a higher level than before in the memory channel, without the need for a new memory material. HybriDIMM can be integrated seamlessly into a number of different CPU architecture like Intel, Sparc, ARM and others. HybriDIMM uses a standard DDR4 LRDIMM form factor, does not required special BIOS changes. It's plug n play for modern servers. HybriDIMM is a Storage Class Memory Module providing storage at memory speeds and memory at storage capacities. HybriDIMM has a block device presentation layer that applications can use without needing any changes. HybriDIMM will initially be demonstrated in 256GB capacity. Version 1 is planned for 512GB at production and for 1024GB in later versions. Why is it called HybriDIMM? The HybriDIMM is the hybrid combination of DRAM and NAND, proven raw materials combined with Netlist IP. It is a persistent memory module that to an application, with the user-level, is storage or memory or both. What servers does it work in? HybriDIMM only requires LRDIMM support so will work in any servers that support DDR4 LRDIMM. What applications does it accelerate? HybriDIMM provides storage at memory speeds and memory at storage capacities while keeping the data safe in a power loss scenario. Many applications in both enterprise and hyperscale need this sort of capability. Examples include big data analytics, data warehouses, on-line data analytics (OLAP), in memory computing, data capture/compliance check, geophysical sciences, simulation and industrial design, bioscience in particularly areas such as genomics, post production and special effects, storage appliances, gaming and more. The PreSight Technology that underlies the HybriDIMM DIMM is directly applicable to more areas than just LRDIMM’s and even DRAM and NAND. 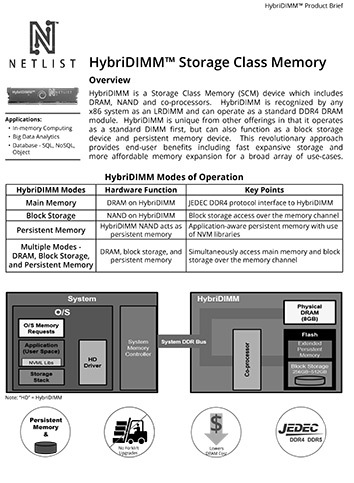 HybriDIMM utilizes Netlist invented a method known as “PreSight Technology”. PreSight is what copies the data that the application needs to be in the DRAM portion of the HybriDIMM DIMM. An important element of this for overall system performance is that all transfers between the two different materials occur on the DIMM rather than locking the memory bus and the penalty associated with that. How does PreSight know what data to move? 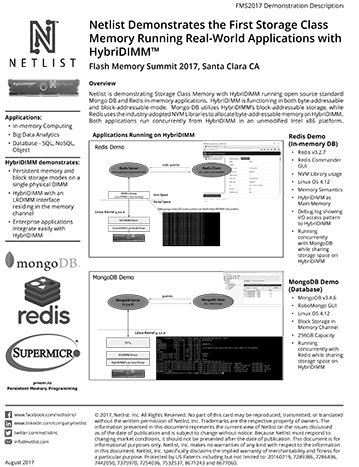 By monitoring the application use of RAM and the data being requested by the application Netlist has determined a methodology that allows for the data to be prefetched into the RAM portion of the HybriDIMM. This can actually take place while the DRAM is being accessed as well. In the unlikely event that the data hasn’t been prefetched the transfer is still on a dedicated bus on the DIMM itself and is faster than a traditional storage fetch vis the CPU PCH.